Hair Transplant Market size is set to exceed USD 24.8 billion by 2024; according to a new research study published by Global Market Insights, Inc.
Increasing importance regarding their physical appearance and hair loss among the people in Asia Pacific region will augment the hair transplant market over the forecast period. Although the prevalence of androgenetic alopecia is lower in Asian population as compared to Caucasians, hair loss is a very common phenomenon in the Asia Pacific region. According to epidemiologic data from several different Asian countries, it is estimated that around 41% to 73% of the Asian population develop pattern hair loss at some point of time in their life. With rapidly growing awareness and rate of hair loss problems, the demand for transplant procedures will only rise in near future. Rapid change in people’s lifestyle across the world will lead to increase in adoption rate of hair loss treatment. Increase in sedentary lifestyles and other lifestyles factors such as smoking, improper diet, stress, inadequate amount of sleep, dehydration, consumption of insufficient amount of protein rich food and deficiency of vital vitamins and minerals are responsible for hair loss. These mentioned factors will foster the growth opportunities for hair transplant market. High cost of the hair loss treatment will be one of the factors responsible for impeding the hair transplant market over the projection years. Also, adverse drug side effects such as rashes and itching of skin will hamper the demand for hair loss treatment, hindering the industry growth. 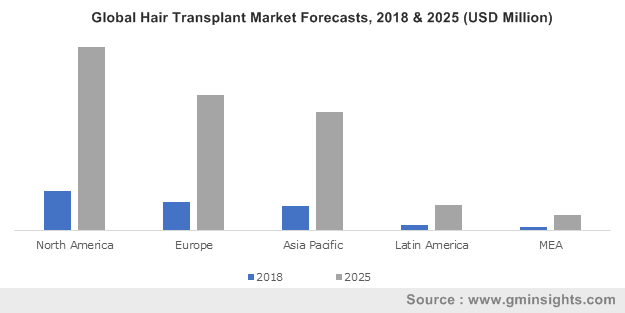 Follicular Unit Extraction (FUE) transplant method is anticipated to experience robust growth in foreseeable future, estimated to grow at a CAGR of 29.0% from 2018-2024. Recent technological advancements in neograft device, powered cole isolation device (PCID), powered surgically advanced follicular extraction (SAFE) system and robotic ARTAS system have resulted in minimizing post-surgery complications and increased patient acceptance, propelling the segment growth. Multivitamins product market held significant share in total market value in year 2017, accounted for USD 163.1 million. Increase in consumption of multivitamins in order recuperate from the hair loss procedure and to control the hair fall will boost their demand. Moreover, unhealthy lifestyle and aging in developed economies will lead to vitamin deficiency and hair loss augmenting industry growth. Platelet Rich Plasma (PRP) transplant therapy market will witness substantial growth, expanding at a robust CAGR of 24.8% over the forecast timeframe. Increasing application of Platelet Rich Plasma (PRP) therapy in hair loss treatment in order to improve hair regrowth will create ample amount of market growth opportunities in near future. Male hair transplant market segment held maximum marker share with a value of USD 4,166.0 million in 2017. Increase in number of male pattern baldness cases owing to genetic predisposition will be a major factor increasing the adoption of hair transplant procedures in males. It is estimated that about 35 million males in U.S. alone are affected by male pattern baldness owing to aging population and genetics that will lead to segment growth. U.S. hair transplant market is estimated to grow at a CAGR of around 24.5% over the forecast period. According to The Hair Society, around 35 million male and 21 million females suffer from hair loss problem in the United States. Increase in number of people with hair loss along with recent technological advancement in the field of hair transplant procedure will enhance industry growth. Turkey dominated the Europe hair transplant market with a market value of USD 870.0 million in 2017. Increase in number of people from across the world travelling to Turkey for low-cost hair transplant treatment procedure will boost the country market growth. Around 5000 tourist patients fly from all over the globe to Turkey each month for hair transplant treatment. Also, rising awareness among the population regarding hair loss and physical appearances will further fuel Turkey hair transplant market growth. Prominent industry players include include Allergan Plc, Beiersdorf AG, Bosley, L'Oreal SA, Lumenis Inc, MEDICAMAT, PhotoMedex Inc., Restoration Robotics Inc., Solta Medical, Inc. The industry players use new and innovative strategies such as improving their manufacturing footprint, merger and acquisition, new product launches and geographical expansion for improving their market place.